I’m often asked about skate blades and sharpening, so this week’s article is focused on the skate blade. The main fact you need to know is that a blade has two edges – an outside edge and an inside edge. Between those two edges is the part of the blade that’s called the hollow. The hollow is an arc shape that you see in the picture on right. The deeper the hollow the more grip and control you will have. But, too deep of a hollow may cause you to be unable to control your skates very well. Also, you will lose speed with a deeper hollow because there is less of your blade on the ice. The toe pick is on the front of the blade. The toe pick is just for jumping. As you get to higher level skates, the toe picks will get slightly larger. Next, look at the picture on the right and see how the blade curves in toward the toe pick. The curve in the base of the blade is called the rocker. This is the part of the blade that spins and most turns are performed on. Technically, you are on either an outside rocker edge or inside rocker edge, depending on the spin or turn. 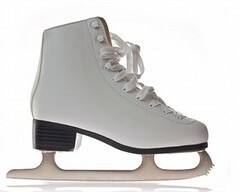 Another interesting fact that you may not be aware of is how blades glide on the ice. The weight of your body on the ice melts a thin layer of ice underneath your blade. This thin layer of water creates a lubrication that causes your blade to glide across the ice. Hopefully, these facts will give you a little better understanding of how the blade works. As for skate sharpening: Try to sharpen your skates once every 3 months if you skate 1 to 2 times per week. If you skate 3 times per week, once every 2 months. If you skate more, once or more every month.